Last week the Joint Ocean Commission released a report highlighting actions that need to be taken to protect and restore our nation's coast and ocean. The report highlights Ventura as one of the west coast communities actively working to put integrated, ecosystem-based approaches into practice in the management of ocean and coastal resources they depend on for high quality of life and a vibrant coastal economy. This is the result of the Ventura Chapter of the Surfrider Foundation's work on Surfers' Point, Matilija Dam, and stormwater and watershed management. This article about the Joint Ocean Commission Initiative report, "One Coast, One Future," correctly highlights fragmented governance as one of the primary threats to our coasts and ocean. 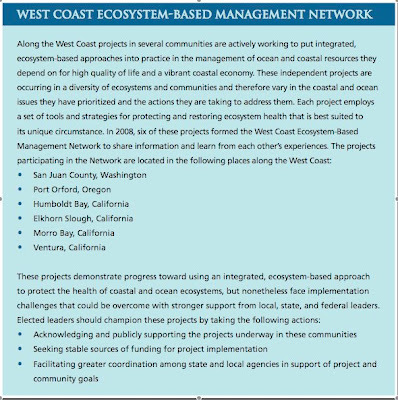 This report also highlights Ventura as one of the West Coast communities actively working to put integrated, ecosystem-based approaches into practice in the management of ocean and coastal resources they depend on for high quality of life and a vibrant coastal economy. integrated strategy for the restoration of the Ventura River watershed, which also includes beach restoration at Surfers' Point and removal of Matilija Dam. many competing interests. However, despite state budget woes, there is now a great opportunity to construct these "green infrastructure" projects with the federal economic stimulus package. can provide critical leadership for securing the health of coastal ecosystems and economies.